French toast is a dish of bread soaked in eggs then fried. 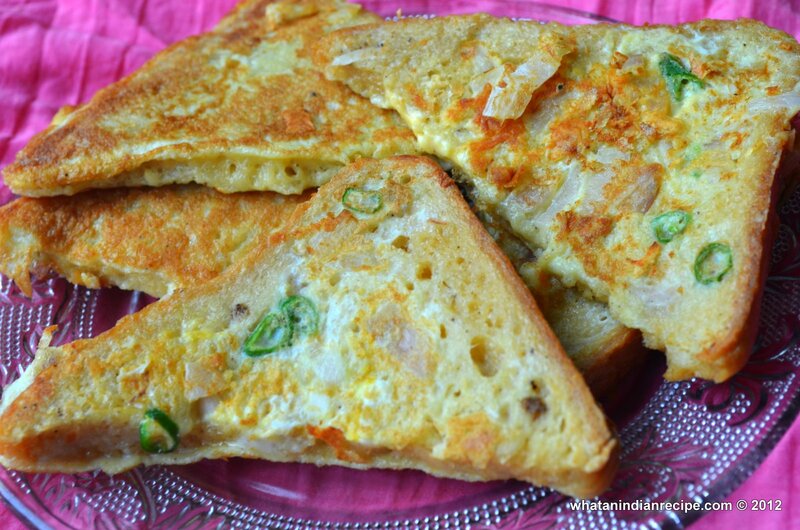 Slices of bread are soaked or dipped in mixture of beaten eggs. The slices of egg-coated bread are then fried on both sides until they are browned and cooked through. Beat the eggs in a bowl till fluffy. Add all the other ingredients except oil to the beaten eggs and beat again. Heat a tava/ flat pan and add 1 tsp oil in in and spread the oil on the tava to grease it properly. Meanwhile cut each bread slice diagonally to make two triangles each. Dip each triangle into the egg batter so as to coat it well and then place it on the hot tava/pan and allow to cook. When one side is done turn it over and allow the other side to cook. When both sides are done remove from heat and serve hot with tomato ketchup.